Alan Durning posts his explorations on the safety of cycling over at Grist. He was motivated to learn just how dangerous cycling is after his son was nearly hit by a car. He makes some good points in his article: Biking is safer than it used to be, cycling is safer than you might believe, the health benefits of daily biking far outweigh the risks, cycling is not as safe as it should be, encouraging cycling in public policy is a great way to to ensure healthy and lasting prosperity. Alan points to some of the resources I’ve counted on for years, including Ken Kifer’s Traffic Safety information. Sadly, Ken died a few years ago after he was hit by a drunk driver, but the information on his pages still holds true. Bicycle Safety provides a pictorial guide to how bicyclists are often hit, and how to avoid those kinds of collisions. I highly recommend one of the bicycling education courses taught by League of American Bicyclists certified instructors. The Canadian equivalent is CAN-BIKE, while similar courses are available in the UK. These classes cover the material mentioned in Alan’s article and also discuss how to ride safely and predictably to avoid those risks. Read the article on cycling safety in Grist. Cycling is safer than you think, and many of the risks in cycling are controllable by the cyclist. 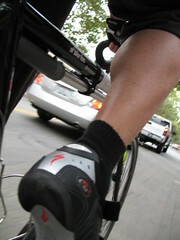 Photo: Me riding with traffic in bicycle friendly Palo Alto, California. Also one new thing for me(now that I have a road bike) I am following the law(ie bike=car), There are Soo many drivers that don’t know how to drive around a cyclist acting like a cyclist, so I do my best to act like a car, I was suprised at the difference, rather than getting buzzed by or honked at, cars treat me like a car. “Just as it is harmless to start a Salman Rushdie Fan Club in Vancouver but is suicidal to do the same in Tehran, whether bicycling is dangerous or not depends on the geographical location. Brian Sorrell lives in Southern California, where so many roads have bike lanes it’s nearly always possible to get from point A to point B without having to compete for space with vehicular traffic. Perhaps more importantly, American drivers are civil and considerate enough to give way to bikers. If you get hit by a car while cycling in America, you can sue the driver’s auto-insurance provider for millions of dollars — accident attorneys will offer their services free-of-charge in return for a portion of the damages awarded to you. Thanks for dropping by, Mr Brown. it should be noted that the safety stats are for U.S. cycling and transportation. Much of the information also translates well for Canada and the UK and probably some other locations. I don’t know what the legal status of cycling is in Singapore, so I can’t comment on how to ride safely there. Quinn, your experience matches mine and that of many other cyclists on the road. With that said, I have commuted on a 26″ hardtail, 29er and a ‘cross bike, and as soon as I started commuting on my ‘cross bike, I noticed that I was treated different, on different bikes. on my 26″ I always got the “wTF, get on the sidewalk”, on my 29er, I didn’t get much flack, on the cross bike people expect me to be on the road. Similar experiences here, tho’ I have “never always” gotten the “get on the sidewalk” thing; just once or twice a year (and it’s been longer than a year, now…) but I do feel like my Xtra is more welcome than my Trek. Yes, there is a sad irony in Kifer’s death. Note, however, that “safe” drivers are killed everyday on American highways, but almost nobody gives a thought to the risks in driving a car. We just grab the keys and go. For some reason, though, every bike trip is an exercise in risk management although the real risks aren’t that much worse. CBB Poll: How far is your commute?